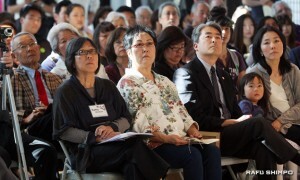 The 25th anniversary of the Civil Liberties Act of 1988 (CLA), which provided an apology and redress payments for Japanese Americans incarcerated by the government during World War II, was the focus of the 2013 Day of Remembrance event, held Feb. 16 at the Japanese American National Museum in Little Tokyo. 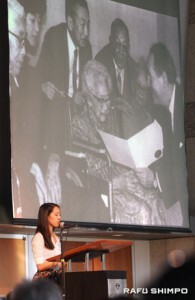 With “Our Struggle, Our Perseverance, Our Commitment” as the theme, speakers urged the Japanese American community to look at the redress victory not as the end of a campaign but as part of an ongoing fight for civil rights. 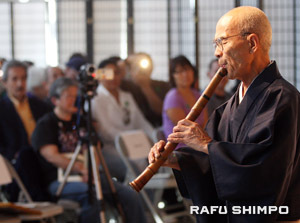 The program began on a solemn note as George Abe of Kinnara Taiko played the shakuhachi. Video excerpts from the Los Angeles hearings of the Commission on Wartime Relocation and Internment of Civilians (CWRIC), held in 1981, were shown. JANM President/CEO Dr. Greg Kimura said, “Watching that video brought back memories. I was 11 or 12 years old, and we got the day off from school to go to the CWRIC hearings in the Federal Building in Anchorage, Alaska, where about 100 families, including mine, were removed and put into concentration camps. I brought my 11-year-old son today here as well to hear part of that story. 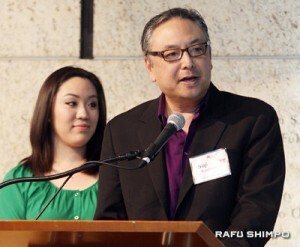 The emcees were Stephanie Nitahara, regional director of the JACL Pacific Southwest District, and Soji Kashiwagi, executive producer of the Grateful Crane Ensemble and a member of the Pasadena Human Relations Commission. For the remembrance ceremony, everyone was given tags similar to those Japanese Americans wore when they were shipped off to camp. Each tag had the name of one of the camps. All former incarcerees were asked to stand first; others were asked to stand when the names of their “assigned” camps were called. In addition to the 10 War Relocation Authority “relocation centers,” the emcees read the names of 26 Justice Department internment camps and two citizen isolation centers. When everyone was standing, a moment of silence was observed. Representing Yonsei and Gosei who organize Day of Remembrance programs on college campuses, April Nishinaka of USC’s Nikkei Association gave a multimedia presentation titled “Looking Back and Moving Forward,” which covered the wartime experience and the redress movement. A panel on the impact and legacy of the CLA was moderated by Bruce Embrey, co-chair of the Manzanar Committee and son of the late Sue Kunitomi Embrey, one of the founders of the Manzanar Pilgrimage. But there was another fight to get appropriations for the payments, and more fights on behalf of those denied redress, such as Japanese Latin Americans who were forcibly brought to the U.S. and interned, he said. Panelist Rose Ochi served as an assistant attorney general during the Clinton Administration and was played a role in establishing the Manzanar National Historic Site. 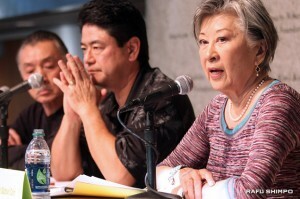 Involved in the redress campaign as a member of JACL and as an individual, she recalled talking with key legislators about moving the redress bill forward. On the House side, she said, Rep. Peter Rodino (D-N.J.), chair of the Judiciary Committee, decided to have a congressman from a “safe district” — someone who was assured of re-election — shepherd the bill. That person was Rep. Barney Frank (D-Mass.). On the Senate side, Ochi met with Sen. Alan Simpson (R-Wyo.) and learned that he was a friend of Rep. Norman Mineta (D-San Jose); they met as Boy Scouts when Mineta was interned at Heart Mountain and Simpson was living in a nearby town. Simpson helped round up Republican votes. A personal connection was part of President Ronald Reagan’s decision to sign the CLA, Ochi added. He was reminded that shortly after the war, as an Army captain, he had eulogized Kazuo Masuda, an Orange County Nisei who was killed in action while serving with the 442nd Regimental Combat Team and was posthumously awarded the Distinguished Service Cross. “The veterans’ story appealed to our president,” she said. 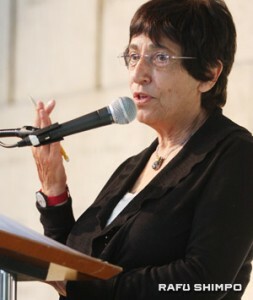 While redress brought “personal healing” for many families, Ochi commented, “What remains is community healing … We have a lot of residual issues that we still need to resolve,” such as the debate over terminology referring to the camps, and “no-nos” and renunciants being labeled as disloyal. Part of the redress story is how “we as a community came together … found our voice to say we were wronged, and we need to be recognized for that wrong,” he said. Ameri was presented with a photo of a peace gathering held in front of JANM to mark the 10th anniversary of 9/11. Kashiwagi issued a call to action. “The National Defense Authorization Act or NDAA was passed by both houses of Congress and signed into law by President Obama on Jan. 2 … Under provisions added to the NDAA in 2012 and continued in 2013, it gives the president authorization to order the U.S. military to pick up and detain U.S. citizens indefinitely without charge or trial for mere suspicions of ties to terrorism. The program closed with special thanks to Carrie Morita of Carrie’s Community Caterers for 14 years of organizing a reception after each Day of Remembrance program.